Tópico em 'Climatologia' iniciado por AnDré 4 Mar 2015 às 12:21. Tópico de monitorização da Criosfera em 2015. De ano para ano, a área de superficie de gelo do Árctico e do Antárctico lá se vão compensando. O primeiro cada vez com uma área mais reduzida, o segundo mais positivo. 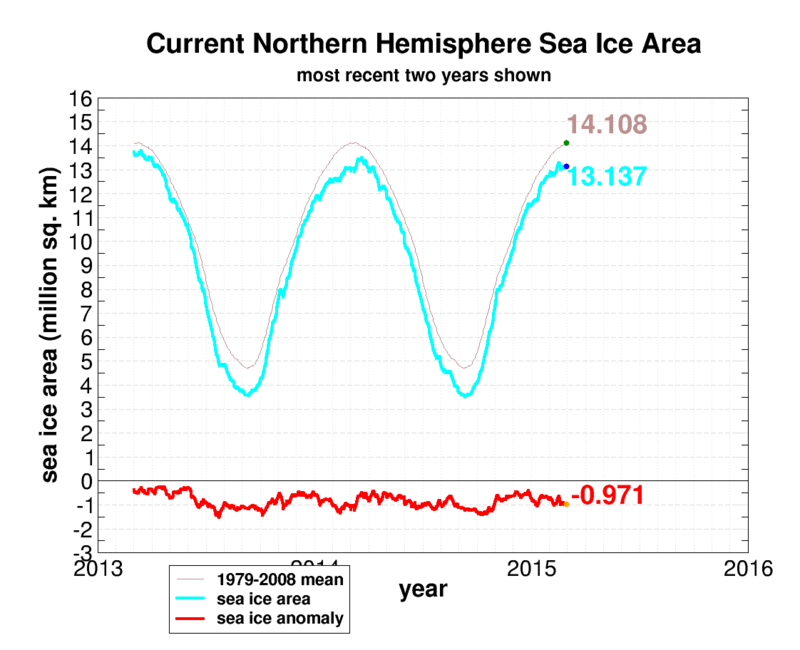 Arctic sea ice typically reaches its summer minimum extent in September, and its winter maximum extent in early March. According to the National Snow and Ice Data Center (NSIDC), Arctic sea ice extent reached 14.54 million square kilometers (5.61 million square miles) on February 25, and then began to decline, signaling that the spring thaw was underway. Unless a late growth spurt takes place, it will be the smallest maximum extent in the satellite record. 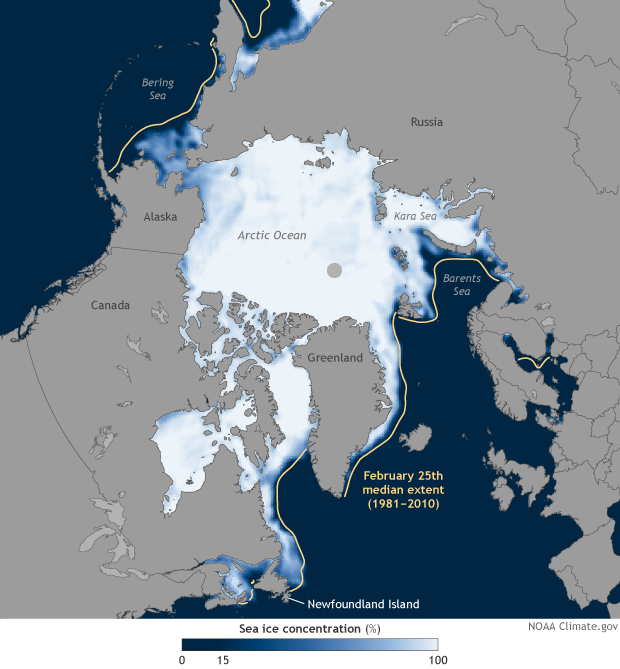 This map shows sea ice concentration on February 25, 2015. The yellow line is the 1981-2010 median extent for that date. 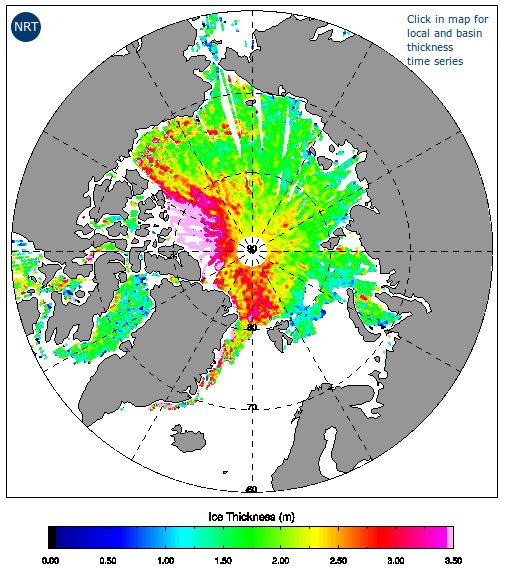 Satellites orbit near but not directly over the poles, so there is a data gap over the North Pole, and NSIDC calculations treat this area as completely ice covered. Despite a small increase after March 9, ice extent appears to have leveled off again, and further growth is increasingly unlikely—though not impossible—as the season continues to advance. That means that the February 25 maximum extent is shaping up to be the smallest maximum of the satellite record, edging out the previous record of 14.67 million square kilometers (5.67 million square miles) set on March 9, 2011.You can compare 2015 to earlier years with NSIDC's Charctic Interactive Sea Ice Graph. A record-low winter maximum doesn’t necessarily foretell a record-low summer minimum. The years 2006 and 2011 both experienced unusually low winter maximums, but neither year went on to set a new record summer low. The record-breaking minimum year, 2012, had a winter maximum close to the 1981-2010 average. Meanwhile, Antarctic sea ice reached its minimum extent: 3.58 million square kilometers (1.38 million square miles) on February 20, 2015. It ranks as the fourth-highest summer minimum extent on record. 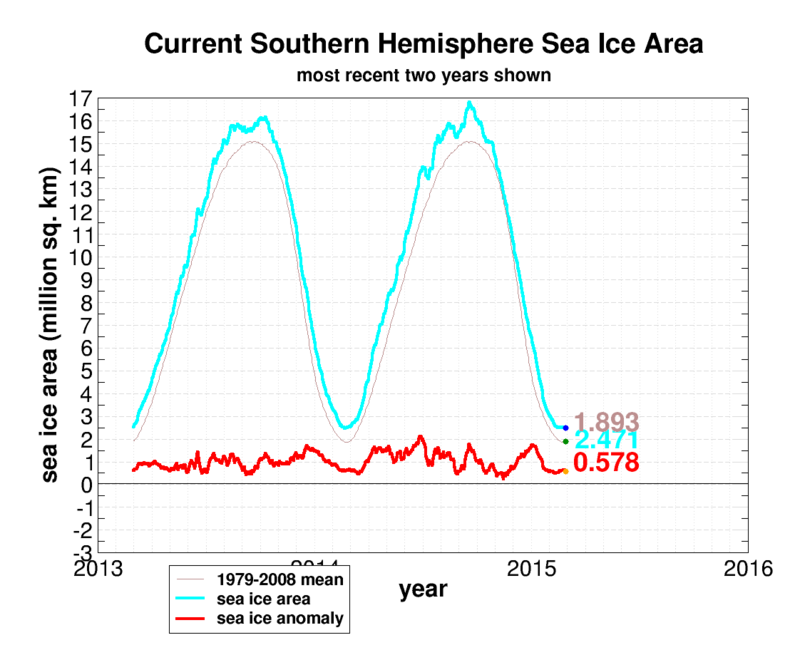 Over the span of the satellite record, Arctic sea ice has been declining significantly, while sea ice in the Antarctic has increased very slightly. Recent research demosntrates that the Antarctic gains do not balance out the Arctic losses: globally, sea ice extent has decreased over the past several decades. Although Arctic sea ice set a record this year for its lowest ever winter extent, it was on average 25cm thicker than in 2013 when CryoSat recorded its lowest winter volume. The latest measurements also show that sea ice around Svalbard, 1300 miles from the North Pole, is today only a metre thick - approximately half what it was in the winter of 2011 just after CryoSat was launched. The thinner ice around Svalbard coincides with a warming of the surrounding Barents Sea. We've already seen the impact of this change in ocean conditions on the Svalbard's Austfonna ice cap where glaciers have speeded up at an unprecidented rate, and the rapid retreat of sea ice in this sector of the Arctic is almost certainly down to the same thing. O degelo do Ártico está, neste momento, ao nível de 2007, ou seja, o 2º ano pior.